The Book of Kells is considered the pinnacle of Insular illumination. 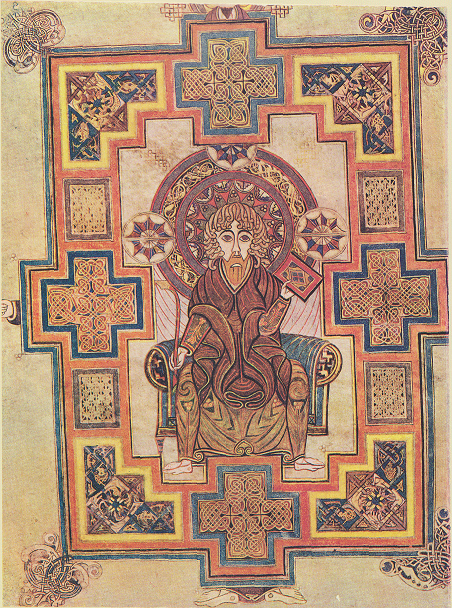 Insular art, referring to the fact that the type of artwork found within the Book of Kells, the Lindisfarne Gospels, and other such manuscripts, was only found in the UK and Ireland. Perhaps it should be Insular Celtic art, that is at the root of the decorations. These include spirals, triskels, and the most complicated interlacing made up of vegetal, animal and human elements. 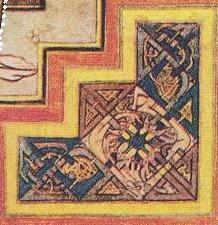 The Book of Kells has the most ornate decoration which can be found in manuscripts dating c600-900 CE. There is still a great deal of debate about its creators, and the place it was created at. It is called the Book of Kells because it resided at the Abbey of Kells in Ireland for many centuries. However, the tradition which names Iona as its place of origin may be correct, since the Chi Rho or XPI page does tie it to the one from Lindisfarne, and the Cygnus formation Derek Cunningham found on the landscape of Scotland. This star map includes Iona, Dunkeld and Holy Island, which is also known as Lindisfarne. St. Columba started his career at Kells, was sent to Iona to found a church there, and was also said to have built a church at Dunkeld. Iona was the mother house of Lindisfarne. 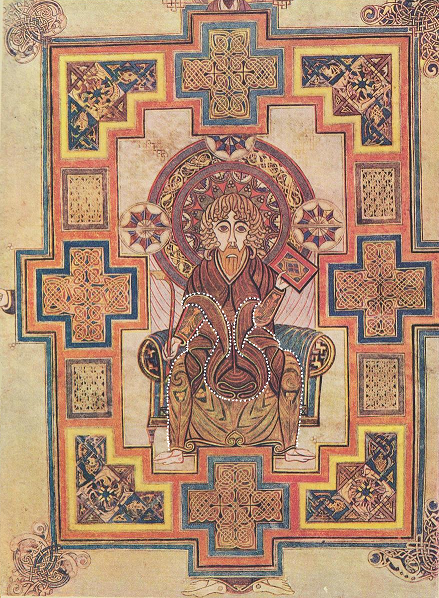 There are traditions which credit St. Columba with some of the artwork, but the experts think it dates c800 CE, later than St. Columba, who died in 597 CE. Their opinion is based on palaeographic and stylistic grounds. Since I’m not an expert, I won’t argue with that, but the Book of Kells includes much older, Celtic pagan symbolism, and at least one person creating the artwork understood Ogham. I discovered the pagan symbolism after studying many examples of Celtic art, which very often include double heads. Sometimes it is presented as one head, but if you turn it upside down, it looks like a different head. Sometimes it is two heads or two men, symbolic of the Summer lord and the Winter lord. There are also examples of a man’s head becoming a woman’s head when turned upside down. This is usually the goddess and her consort. I wondered if this had continued on in the monasteries, and found it did in the Book of Kells, at least on some pages. Since I’ve only just written about the propheta head-gear, I thought I’d write about the portrait of St. John first. This page has always been a bit of a mystery, since St. John seems to have hands for feet. The monk did know how to draw feet, there’s a pair of them below the frame of the picture. Incredibly, some of the artwork in this book was considered rather childish at one time. I have not read any of the latest books devoted to the Book of Kells, so I don’t know if someone else may have recognized some of the things which I have found there. However, in “The Book of Kells”, as described by Sir Edward Sullivan, which also includes a historical analysis of Celtic illuminated manuscripts by Johan Adolf Bruun, there is no mention of the things I have discovered. Only the obvious is mentioned, but the things I find just as obvious are not mentioned. Perhaps the critics of the early 1900s didn’t recognize the old Celtic pagan and astronomical messaging. Once I had recognized the propheta head-gear, I realized that it is a person kneeling in front of St. John, that’s why he has his hands on the floor. St. John wrote Revelations and became a prophet by doing so. The way it has been designed, makes it look as if it is part of St. John, but may hold more meaning. If this propheta head-gear was part of the druid tradition, then it is showing the old propheta kneeling and bowing his head to the younger one. Christianity taking over from the old ways. This monk created some of the most outstanding pages in the book, that I have seen. Even if it was c800 CE, this monk was still hanging on to the old ways, and like a true Celtic artist, he left messaging in his work. The sort of messaging which many people have totally missed, because much of the symbolism is very old. The Hittite hieroglyph for ‘propheta’ dates between at least 1700-1200 BCE. Even if it was 1200 BCE, it would still be a 2000 year old symbol this monk was using. The clue to this page is on the book St. John is holding. There we have a lozenge or diamond divided in four. The lozenge or diamond, and the number four both symbolize the ‘hidden secret’. No lozenge or triangular shape in or on ancient artefacts in the UK and Ireland should be disregarded. They all belong to the knowledge of the astronomer, surveyor, navigators. It’s a signature they left behind. The first thing I noticed on this page was the haloed head, then the beard and down the arm, which is positioned in the wrong place. No doubt on purpose. This is the one holding the book, which told me there was a hidden secret on this page. The secret being the kneeling prophet. I think two different people worked on this page. The original monk created the layout, the central figure, the four corner decorations, and the decorations around the frame. He has the two faces on the outside of the four corners. These look more animal than human, but they are still the Summer lord and Winter lord. The four equal armed crosses and the rectangles on the border were filled in by someone else. Someone not quite as talented as the original artist. The corner detail is quite wonderful, its been bordered in yellow with a step formation suggestive of lightning. Inside of this is the Square of Enlightenment, the square with its corners turned to the cardinal points, which contains two white dogs entwined with eight horned serpents. Likely the dogs’ ears were red. Many Sun gods were accompanied by white hounds with red ears. The dogs in this picture are the two halves of the year. The eight serpents represent the eight divisions of the year. Their bodies form twelve triangles, the twelve months of the year. There are a great many stories about the white hounds with red ears, which made me wonder what that was all about. Looking at it astronomically, I discovered that these likely started out being Sundogs or parhelia. Parhelia comes from the Greek word, parelion, meaning ‘beside the Sun’. These are an atmospheric phenomenon that creates bright spots of light, often seen on a halo as shown below. They are often coloured, with red closest to the halo, and white and then blue further out. They appear to the left and right of the Sun, 22° distant and at the same level as the Sun. Sundogs can appear anywhere on Earth at any time, but are best seen at dawn or Sun down, and since atmospheric ice crystals create this interesting effect, they are seen more often at cold times of the year. There are also Moon dogs which people seldom see, since it’s at night. Like eclipses, they were feared in ancient, and not so ancient times. They were generally viewed as bad omens. Hence the stories of Hell hounds, which were white with red ears. Since it appears like three Suns, I have to wonder if this is why Lugh/Lugus was sometimes shown with three faces or heads. The Sun in the centre is referred to as the ‘pillar’. Oddly enough it has a triangular head, similar to the Lugh’s head I hung at Stonehenge. 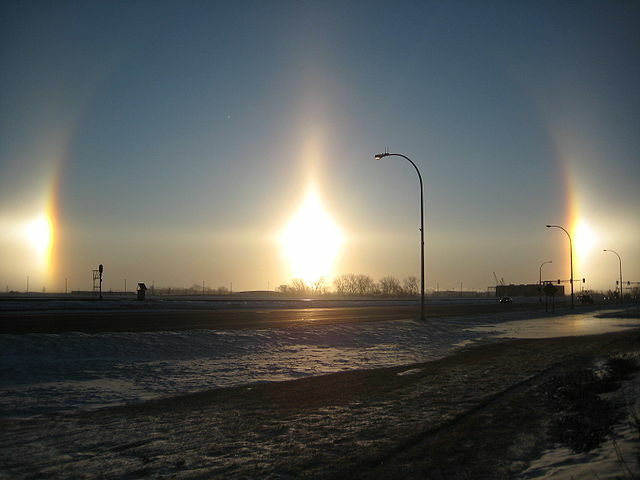 Picture of Sundogs at Fargo, North Dakota, taken on 18 February, 2009 by Gopherboy6956, found at Wikipedia. This entry was posted in Ancient History and tagged Book of Kells, hidden secret, illuminated manuscript, Iona Scotland, St. Columba, Sundogs. I would say Kells is an early date to the time of Ogham writing when the Druids finally decided to be less secret about their philosophy and started recording it in coded form in books like Kells. I was rather surprised to find it in the Book of Kells, considering they were Christians and it is supposed to date c800 CE. However, the early Culdee church was still full of people from Druid traditions. Iona, Dunkeld and Lindisfarne do have connections to St. Columba and he was brought up by Druids, this is why he is referred to as a Crane cleric. But still……………..thought this date was rather late for that. I am thinking Alex is right. I found something on the Goths in Europe that indicate clearly that the knew extremely secret knowledge as late as 600-700 CE. Just because the Democrats are in office does not mean the Republicans are gone! The Book of Kells has many strange details. Think the bolts in the feet are meant to be the ankle bones. Hmm……..the extremely secret knowledge all had to do with astronomy, higher math, weights and measures, surveying, architecture, engineering, metallurgy, chemistry, the calendar and navigation. Knowledge of all that brought money and higher positions, even when there was no money, there were the perks, which is how you would get paid………..then. No doubt it was handed down in several ways.